Raul Gonzalez III’s “Black Cloud Buzzing” at Boston Center for the Arts. Nobody at the opening reception for “Yeah, You Missed It!” — an ambitious, nimble pop-up show last Friday and Saturday at the Boston Center for the Arts Mills Gallery — was allowed to take a picture. Experiencing art through a camera lens distances you from the art, and this show was about immediacy. “Yeah, You Missed It!” is one in a series of brief exhibitions curator Robert Moeller has mounted, and the first in a formal gallery setting. Their fugitive quality adds urgency; each is more like a one-time performance than an exhibition you can squeeze in according to your schedule. Moeller hung paintings higher than we’re used to, and included installations that ran from floor to ceiling. If craning to see the art was slightly more effortful, it also shifted the nature of a viewer’s attention, which was a bit fraught, lively, and a lot less contemplative. That’s not to say the work wasn’t arresting; it’s more that Moeller had throttled up the viewing experience. His zippy selection of artists, spanning highly acclaimed to newly on the radar, also added buoyancy. Painter Anthony Palocci Jr.’s “Looking Up” set the tone. Palocci finds abstraction in mundane scenes; here, he has us gazing through a mesh screen up at a high rise. The black grid of the screen vaults upward, as yellow and red gleam amid passages of gray beyond it. Meanwhile, “Downs and Ups,” painter A.B. Miner’s graceful diptych nearby, captures two faces of the same man in profile. One looks down, resigned; the other gazes upward, tender and open. Formal correspondences ricocheted around the space. 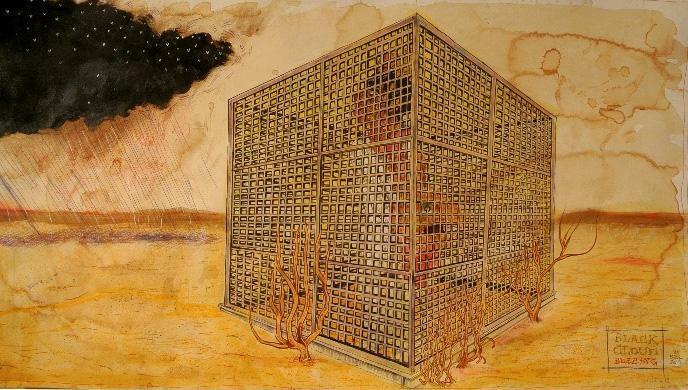 The thick mesh in Palocci’s painting nodded to Raul Gonzalez III’s mixed-media drawing “Black Cloud Buzzing,” in which a man trapped in a densely gridded cage watches the approach of a black cloud seeded with insect wings. Really more a sculpture, Caroline Bagenal’s “Text Drawing” is a grid made of reeds wrapped in tightly coiled newspapers and rapturous colors. Some of these lines arc, others are straight; it’s part boat, part sleigh, part net. 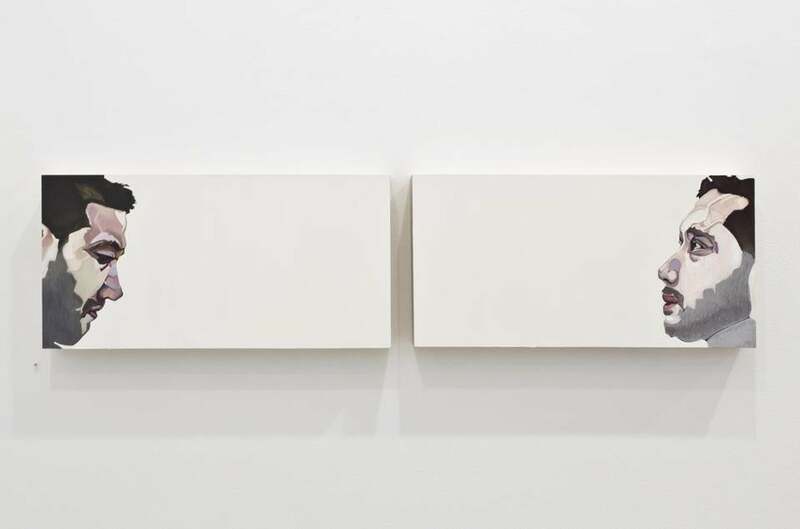 In the show it hung near Franklin Evans’s mixed-media watercolor “Handstapematisse,” which floats several samples of a Matisse image of hands in a soft, blinking fuchsia grid beside an off-kilter assortment of colored tape. On the surface, Gonzalez’s dire narrative, Palocci’s urban landscape, Bagenal’s abstract sculpture, and Evans’s dreamy, art historical montage appear to be in different realms. Like members of the same family, they use their genetic material — the grid — in varied ways, but the fleeting resemblances add context and deepen meaning. Two spare, totemic installations faced off in opposite corners of the gallery. Pat Falco’s untitled assemblage featuring graphic drawings (one depicts a newspaper headline: “Everybody Dies. Nobody Minds.”), including one on the screen of a small TV abuzz with static, was comic and deeply melancholy. Andrea Sherrill Evans’s “Firewood,” a series of watercolors depicting the cut ends of logs, ran up the wall in a disorienting syncopation. We associate firewood with tidy stacking, but these pieces skittered upward like frightened birds. Their round forms recall faces, which gazed across the gallery at Falco’s sad figures. If you missed it, it was a vibrant, smart, bustling exhibition – in addition to the visual art, four performance artists performed at the opening. Keep an eye out. Maybe Moeller will do it again. “Excavations,” a group show curated by Adrienne Jacobson at the New Art Center, is much quieter than “Yeah, You Missed It!” Jacobson has tapped artists who dig up, dig into, peel back, and expose. Yet in the process of revealing, we also discover misdirection, new veils, and new meanings. 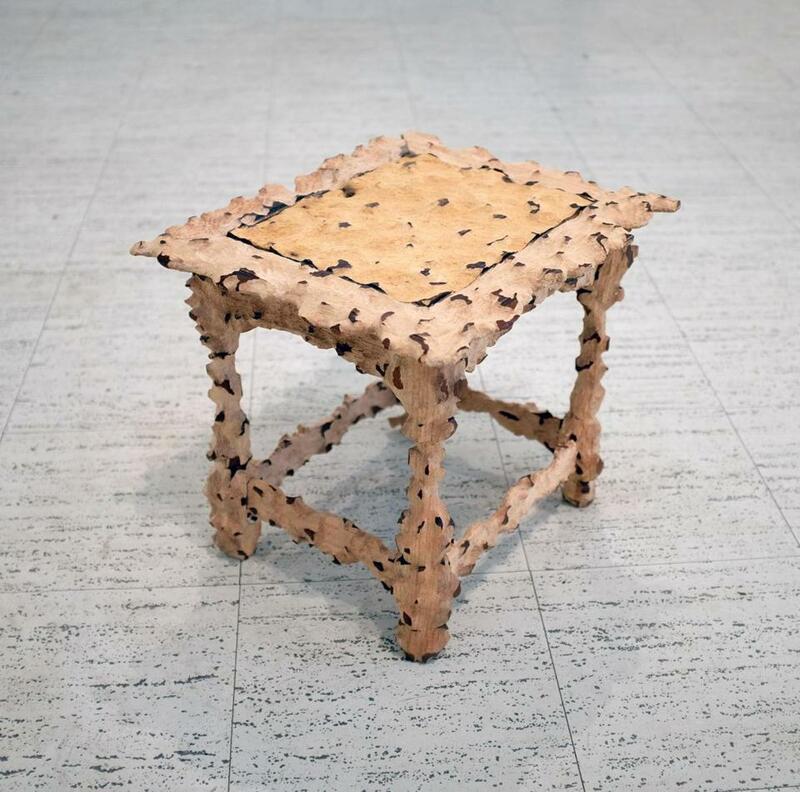 Jill Slosburg-Ackerman carves into furniture found on the street. Her “Mother Work for Edward Snowden” is a low table, the finished surface nearly all gnawed away. Imagine Snowden himself, cast out like this table, or imagine the fallout from his revelations — either way, it’s a picture of exposure and fragility. Ken Landauer also carves into wood, revealing inner layers. In “Excavation 1FW,” he carves a frame from found wood, and then he digs out more deeply within. The format suggests something precious, yet it is all layers of the same wood. Jill Slosburg-Ackerman’s “Mother Work for Edward Snowden” at the New Art Center. For his enchanting sculpture “Rift IV,” August Ventimiglia made a plane of dried plaster, then, like a magician pulling a tablecloth from a set table, removed the support from beneath half the work. That half dropped, and a crumpled seam opened between the two halves. There’s violence to the fissure, all the more disturbing in the pristine white of the plaster. Shannon Rankin cuts up maps and puts them back together in collage and sculptural formats. For “Basin,” she cut and layered several wavering rings into a topological rendering. We can no longer find our way using her maps, but drawing attention to their language, she orients us to a different route to understanding. Many of the pieces in “Excavations” have had their easy cultural codes stripped away. We recognize these objects, but they’ve shifted toward the unknown. Freighted with familiarity and loss, they call to us from a distance, and invite us to explore that uncomfortable gulf.